Sweet! I was just swearing to myself after a few drinks and beers, wondering what the heck was going on. Done the cheeve once, repeated it once, but now for my third round, chests are already open.. anyways.. Looking forward to a quick fix to this, since getting AP's after 32k is a pita. Looks like it's time to just kill kraits and horde the keys until it is fixed. I just want a krait revenge, a Django Krait causing panic for people slaughtering their race for no reason. So this is strange. Today I went to get my Blood in the Water daily done, went to Frostgorge this time instead of Gendarran, where I had been going since this bug cropped up(10 keys ago). Oddly enough, I was able to loot the chest and while waiting for krait to spawn, another random person came by and looted it(you can see the chest opening animation). Don't think it's "Fixed" though, there was another person killing krait and said that chest was bugged for him. do you have to complete the whole rounds of sunken chests before all resets again? Once the bug is fixed, it would seem so. This is apparently not bugged for everyone. I check chests at least once a day and every time there's been a Veteran Krait Treasure Hunter or three hanging about, meaning that someone has opened the chest recently, I assume. after the big announcements and hype for this new achievement, it is somewhat disappointing that it is on the "to do list" and not anymore info. it would be nice to have a "gift" for all the fuss without answers. Probably asking for the moon though. No gifts here. Yep...still stuck on second cycle of achievement on two accounts. 6 chests didn't reset on this account, and 2 didn't reset on my other account. This is a known bug. ANet are actively working on a solution, but do not have a timeline yet. The thread that @Illconceived Was Na.9781 linked to has the official statements, if you want to hunt them down. Yes. Whatever triggers it is not uniform, and was not the patch. People keep happening into it over time, and apparently (but rarely, at least from comments), some people occasionally have it recover a bit. I know (factually) that only the keys were time-gated--------the chests could be opened in a single day. But each chest has a limit of once per day. Now it appears that EVERY chest is in a "permanent" OPEN status-------still guarded by the Veteran Krait--------but unusable for any purpose. Keys can still be obtained but until the chest mechanism is fixed-----------they'll just take up storage space. After reset I log onto my main account, do the dailies with Blood in the Water last. I switched to the next account which loaded on the same map which said I did the daily. It was impossible for me to have already done them as it was barely past the daily reset. My assumption is that this achievement is doing something like what happens with the Trading Post. You can look at item prices and sales, then switch accounts and see those very same recent sale and viewed stuff despite being a different account. Its saved client side in some way. It's interesting to me that the tp value of swim infusions hasn't really increased over the past week, which says to me that either ppl aren't very interested in buying those that are available or not enough ppl are affected by the bug to affect the supply . . .
Now it hit me as well. But the keys aren't gated, either. You can get your daily, and get them as a drop. Due to the bonus week-long event in WvW, they are dropping quite frequently. Multiple keys as drops per day, per character means there is no time gate. This is just a bug, and will be fixed shortly. Until then, keep collecting your keys as the chests will be available again, soon! We don't even know if Chests are limited to once per day; only that Chests are limited to once per cycle of 10. I don't think anyone had 11+ Keys stored up before the bug hit to test it. I read all the information here in the forum and I have some additions to make. I have three accounts. One basic, one at HoT and one at POF. I followed the sequence on all three accounts correctly, opening the chests once a day. After the first sequence, I can no longer interact with the chests, although every day I go from chest to chest, checking if any of them are available. One of the accounts I already has ten keys and nothing, don't open any chests more. One of the information contained in this forum, would be that this achiev could be repeated ten times. Well, I only did the sequence once. If you allow me my sincere opinion, this is the event of the moment, and I imagine that arena.net support has a lot of work to do, or they are having a lot of trouble correcting this bug. Well, let's hope it gets resolved soon. Ah yes, completing, I started to collect late, so I do not think the bug happened on a specific date. By reading the messages, there are several diverse occurrences. One of the reports says that they drop more than one key, other reports, a chest can be opened more than once, other cases report that the player can no longer open in the middle of his sequence. And similar to mine, they can not do the sequel any more. I'm well over 10 now so I'll find out at soon as they fix this. I had 8.. opened 2 and have since gained 2 more keys from dailies.. but zero chests are interactable. And the bug has yet to be fixed. Thus, we still don't know. Well, we know that people were able to open more than one chest a day, and able to complete a full cycle and start the next one, without delay. These things were true before the bug came up, so unless the bug fix changes something, we can reasonably expect that -- at a minimum -- we will be able to complete the Master Diver achievement once a day, until all keys are consumed. Yep, we know that. What we don't know is if we can open more than 10 chests per day. I'm guessing we can, but time will tell. The veterans were shown to respawn independent of anyone opening the chests. But the point that the chests aren't bugged for everyone stands, based on others' observations. Sorry, that part wasn't clear from my reading your comment. You are quite right there. (laughs) Good theory. It's logical. So I started out opening a chest a day, then the bug hit... I thought well if I just wait to get 10 keys then this will be fixed and I can open all at once. 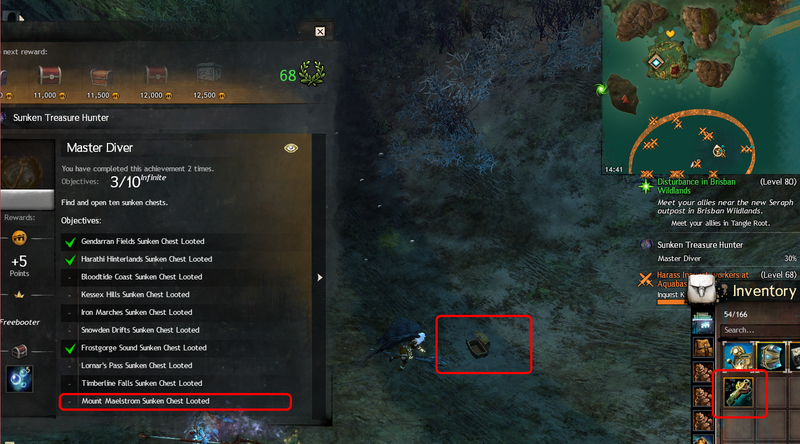 So after 10 days and I got a couple of key drops for wvw, I went to all maps and none have respawned. So here I sit with 12 keys just hoping one day I can proceed. You can't tell that from just observing. For all we know, the people we observe opening the chests since this bug started haven't opened them since before it started. They may even be opening them for the first time so they've never been unavailable. This is a known bug; way back up the discussion ANet confirmed that the developers are working on fixing it, but there is no specific date for the fix yet known. the bug has hit me now too I was able to get thru 3 rounds of 10. I saved til I had 10 keys and would open all 10 in a day. Had my 4th set of 10 keys and went to use them but the chests are open. guess I will just keep saving keys til the fix is implemented. With 15 keys and counting in storage, and being unable to interact with any of the chests at all on any level for almost 2 weeks (I had a couple of key drops), I'm now seeing more people coming up to the chests, then swimming away or only hanging around to kill Krait for the daily THEN swimming away, than I see interacting with them. I have an account that's been active since Beta. I have both HoT and PoF with 254 mastery, and all of the characters tried had 100% map completion. I used Asura Rangers (Druid) to go to kill Krait and open chests. One is just over five years old, the other is just under two. I got my first key from the NPC and got another one from kills in Bloodtide Coast. That first day, I opened one chest twice in a row (in Bloodtide Coast). It was NOT time-locked. I was killing Krait mostly in Caldon Forest in the water north of the Hylek village at Zopatal Grounds for the Blood in the Water daily. Since then I've done the Blood in the Water daily each day, and went through the list twice. Since I was blocked, I've tried several different profession types, used both Human and Asura (mostly Asura) with different ages of characters and professions. Now, I just hang around the one in Kessex Hills (the next on my list) and get the daily that way. With or without keys in inventory before getting the daily or after, the chests remain basically like background art. I have NO idea if this is even relevant, but I suspect finding patterns of similarity among the affected accounts might be helpful. I find it remarkably annoying to be locked out from this, especially since I maxed out my daily achievement points and have only these things left to do to get more. The sooner the devs get this fixed the happier the GW community will be. Anyone else have +15 boosts on their masks? I assume you're talking about the swim speed infusions. I have a +13 on. ^Yes, I do, and I have yet to encounter the 'bug'. is there any news on "Sunken chests" problem? ...well, the list being long, serious exploits and progression blocking bugs in the story taking attention, people being at E3, and presumably this being a semi-difficult problem, are all candidates for why this is taking so long. If there was news, it'd be here already. Asking isn't going to bring faster results, or faster status updates. I actually have 2 characters with +15's, I was able to complete the achievement twice before it bugged on me, so I got quite a few already. Still tho, I currently have 17 keys I cannot use. I'm stuck at 7/10 and have been for the last 9 days. The 3 chests I have left look opened and not interact-able. yeah and all developers are @ E3. As of tomorrow, this event will have broken for more days than working for some players. It represents the only Current game content - and was announced by Anet with much fanfare back on May 8th, though began to break May 27th. As more and more players get caught in the 'permanently open boxes' issue, there is greater frustration. And despite one indirect announcement from the devs, we've had no schedule for a fix. For those saying "_ Asking isn't going to bring faster results, or faster status updates_," - this forum is precisely where players come to express frustrations and concerns, something which Anet itself encourages. The length of this thread and the number of posters also testifies to concerns. This clearly needs fixing. It would be great to hear when that might be. It may already be 'fixed'. 'Fixes' don't go out by themselves (unless game-breaking, or released with a hot-fix for a game-breaking issue), for the most part; they are included in the next scheduled release. I honestly don't mind when it comes out. As long as they remove the daily limit of opening chests, I can farm keys to no end and hold them for better times. What is that limit, I've opened 3 in one day in the past just fine? As long as it's more than 1 per day then clearly over time everyone's backlog of keys will be able to be used .. it's not like there's any kind of rush here, it's not like this content completion is needed to unlock anything else. I am experiencing this also. I am having the same issue as many, visually open chest that are not intractable. Good to know, thought I heard some players claiming it's 1 chest per day. Or i just misunderstood them, didn't make much sense to me either. The minimum would be 10 chests -- one full cycle of the achievement -- based on what we learned from people with extra keys. The maximum would be all your keys, cycling through repeatedly. We can't, yet, confirm exactly which because nobody that had 11 keys on a single day has come forward. I strongly suspect, though, that it is the later: I was able to finish the achievement, get a random key drop, and open the first chest for the next cycle in a single day, suggesting that there is not a cap on how many times you repeat the cycle. 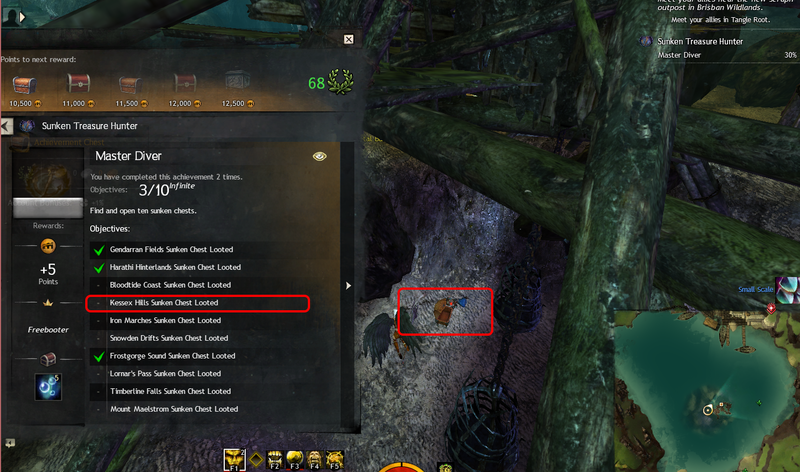 There was a lot of speculation, before ANet confirmed this was simply a bug, that there may be some strange cooldown. Some of that speculation was trivially disproven, such as "one chest per day", since multiple people have opened two chests in one day. Since the post about it being a confirmed bug, various people have been repeating variations on that as "received truth", leading other people to worry about it, so they repeat the concern, leading to more people reading it and worrying, and so the infinite cycle continues, based on what was really just "do we know what is going on? is this deliberate, or is this a bug?" speculation way back. So: ANet have confirmed that we are facing a bug, and player experience confirms at minimum you can open a full cycle worth of chests in a single day -- and probably more, but we can't be absolutely certain of that yet. Worst case, though, you gonna burn through that key backlog real quick. I am also a beta account, I also have HoT and PoF al char used had 100% map completion, Asura warrior ran through list twice and had a block on first chest in third run through, I save up 10 keys before a I start a run of 10to opens, now with 19 or 20 keys waiting, I just get each days new key. also no masks infused with the 71 +10 infusions I had stored after run 2.